Shalyah Fearing from Team Adam sings “And I Am Telling You I’m Not Going” on The Voice Top 8 Semifinals Live Shows, Monday, May 16, 2016. Shalyah Fearing received standing ovation from all four judges. Here’s what they have to say about her performance. “You better lived, you are singing for your life. You are so fearless and you have so much guts to do when your singing up there. That’s extremely hard to sing. You brought down to the stage,” said Christina Aguilera. “It’s unbelievable that you are just 16 years old to comprehend and communicate. You continue to deliver and I think it was amazing,” said Pharrell Williams. “Im always impressed by you but I was overjoyed that we have this moment. This girl deserved to be in the finals,” said Adam Levine. 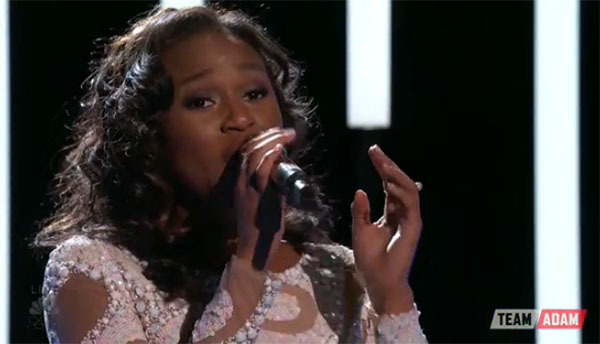 Did you like Shalyah Fearing’s performance tonight? Share your thoughts on the comment section.